University of Richmond’s annual Science Symposium will be held Sept. 22 in the Gottwald Center for the Sciences. The day will include a panel discussion, a showcase of student research projects and a keynote presentation. The Science Symposium is presented by the Integrated Inclusive Science Program, an innovative program that integrates the scientific disciplines (biology, chemistry, physics, math and computer science) and offers students the opportunity to study the sciences in an interdisciplinary manner, while gaining research experience with a UR faculty member. Many of the student presenters are part of the program. The Symposium will kick off at 12:30 p.m. with a panel discussion focusing on “Communicating Science to the Public and its Impact on Federal Funding.” The panel will be held in the Westhampton College Living Room, and guests are invited to bring their own lunch to enjoy during the discussion. Brenda Thomas, director of grant support at the University of Richmond. 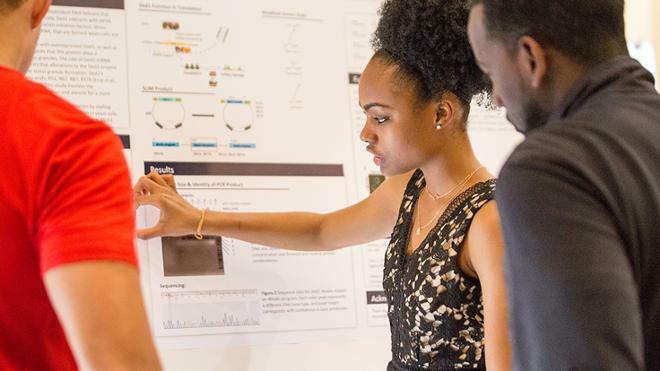 Beginning at 2:30 in the Atrium of Gottwald, about 100 students will present research they conducted over the summer in the areas of biology, biochemistry, chemistry, computer science, geography, environmental studies, mathematics, mathematical economics, physics and psychology. Projects include: psychology-based research examining how subtle cues to class can affect evaluations of political candidates; chemistry research focused on turning carbon dioxide back into a liquid fuel that can be used in both the energy and transportation sectors; and a math-focused project that attempts to solve healthcare without the need for legislation. Other projects can be found on the School of Arts and Sciences website. Anita Layton from Duke will deliver the keynote address, “Unraveling Kidney Physiology, Pathophysiology and Therapeutics: A Modeling Approach,” at 4:45 in the Gottwald Auditorium. Layton’s presentation will focus on the application of mathematical modeling to important questions about kidney function. Panel discussion: “Communicating Science to the Public and its Impact on Federal Funding"
-Michael Kerckhove, associate professor of mathematics and Symposium organizer.